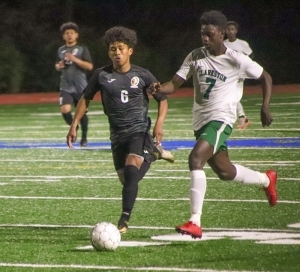 The top spot in Region 5-5A boys’ soccer standings was on the line Thursday night at North DeKalb Stadium with the Class 5A No. 3 ranked Cross Keys Indians grabbing a 3-1 win over No. 2 ranked Clarkston. Cross Keys struck first with 28:35 to play in the first half as Eduardo Dimas took advantage of a free kick from the right side about 20 yards from the goal. His long kick went in just under the cross bar into the far-left corner for an early 1-0 lead by the Indians (9-1-0, 4-0). Clarkston captain Elie Tshiamala knotted the score nine minutes later as he put a penalty kick into top right corner with 19:12 remaining in the first half to make it one goal apiece. Both goalies had big saves over the next 11 minutes as the two ranked teams battled evenly until Cross Keys got another free kick, this time from the left side. Cristian Nandi matched Dimas’ kick from the opposite side also hitting the far, top corner to give the Indians the lead for good at 2-1 with 8:03 to play in the first half. The two teams went to the half with Cross Keys holding the 2-1 advantage. Clarkston goalie Bombi Valentin had a pair of big saves in the first 23 minutes of the second half to keep Clarkson within one shot of tying the game. The Indians would get an insurance goal at the 14-minute mark of the second half as Anthony Maldonado got past a charging Valentin some 25 yards out. Maldonado then was able to get a shot out in front of another defender that got past and into the goal to make it a 3-1 Cross Keys’ lead. Clarkston (9-1-1, 5-1) had an opportunity to close the gap to one with 10:13 left on the clock, but a goal was disallowed due to an offsides call on the Angoras. Cross Keys kept the Angoras well outside of good shooting range throughout the rest of the game to seal the key Region 5-5A win. Indians’ goalie Francisco Ignacio was big in goal with some key saves to keep Cross Keys in the lead during the last 25 minutes of the game. Bu Meh’s goal with 7:06 to play in overtime proved to be the game winner as the Clarkston Lady Angoras sewed up the team’s first playoff berth since 1999 with a 3-2 win over the Cross Keys Lady Indians in the opening game at North DeKalb Stadium on Thursday night. The two teams played a scoreless second after Cross Keys rallied to tie the game at 2-2 before the end of the first half. A 15-minute overtime was instituted this year and the two teams went head-to-head for almost eight minutes of the overtime without a score until the Lady Angoras (8-4, 4-2) got the ball deep into the Cross Keys goal area. Neera Gurang hit a shot hard off the Cross Keys goalie and teammate Meh picked up the carom for a shot into the net for the game-winner. Goalie Kyla Mullins came up big with a save with 4:56 to play to preserve the Lady Angoras lead. 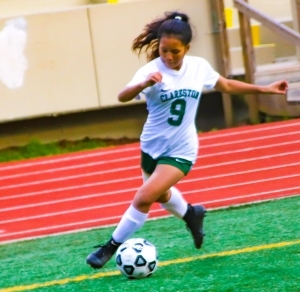 Clarkston had lost eight consecutive games to Cross Keys since 2011 and with a playoff spot within grasp the Lady Angoras scored two goals in the first three minutes of the game. Bu Meh blasted a penalty kick into the net just 1:09 into the game for an early 1-0 lead. The clock only ran off 1:01 before Doreen James picked up a deflection off the Cross Keys goalie for an easy tap in goal to make 2-0. It would be over 21 minutes before another score would come when Cross Keys’ Karolyn Toro got past the Clarkston defense on a break-away to cut the lead to 2-1 with 16:36 remaining in the first half. Toro was the culprit again for Cross Keys (1-7, 1-3) with just 1:07 to play in the opening half with another break-away past the Clarkston defense for the game-tying goal.